The Cormet de Roselend links the town of Beaufort, famous for its cheese, with the town of Bourg St Maurice. 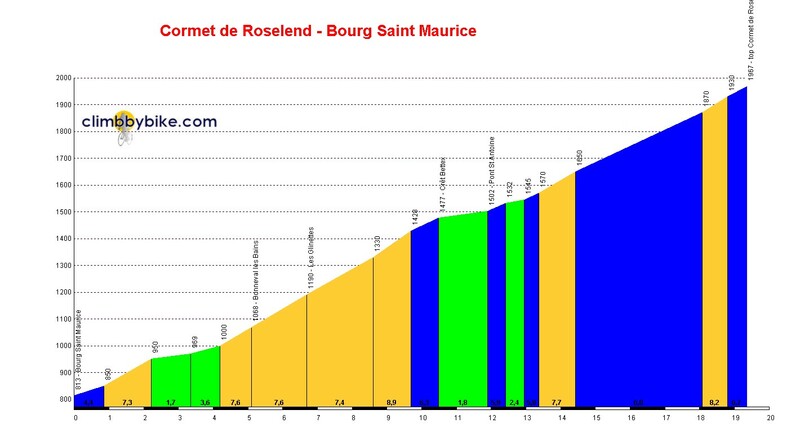 The climb to the col from Bourg St Maurice is a tale of two climbs; the climb starts immediately upon exiting the village and heads up the narrow Vallée des Chapieux. The challenging hairpins above Glinettes are followed by a kilometre and a half of respite just after Cret Bettex. The second half of the climb begins with a long straight before a series of twists, turns and switchbacks before the final push at 8% eases off for the final dash to the col. The col has been crossed by the Tour de France 4 times from this side. When the Tour last crossed the col in 2009, it was the Norwegian sprinter Thor Hushovd, who in an unusual move, attacked during the early climbs to defend his sprinter’s jersey.